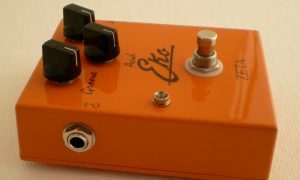 Eko is an analog delay based on Scott Swartz analog delay, two BBD circuits (V3205) gives about 400mS of analog delay. 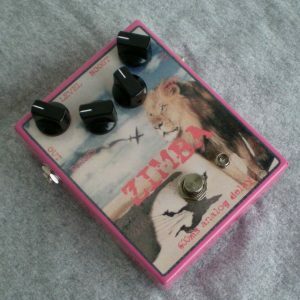 The unicorn MKII is an update of The Unicorn, I’ve added modulation on the wet signal, from slow wobble to fast oscillation by the knobs Speed and Depth. Thanks to Björn who has contributed with the soundclips. A circuit based en the Boss VB-2 vibratopedal. It has been rebuilt in the rampsection, allowing it to speed up the vibration in rate. The rampknob then controlls the acceleration of the rate. Developed with involvement with Björn Greder who has contributed with sound1, in sound2 and 3 he has used the speedster with The Unicorn. Last clip is recorded by me to demonstrate the ramp function. 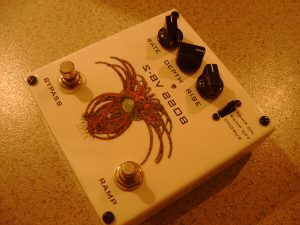 A 600mS analog delay, truebypass, built around three V3205BBD circuits. 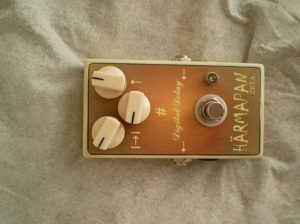 Controls for Level(level on the repeats), Boost(about 24db off volume boost is accesdible), Echoes(number of repeats), Time(delay time), + an internal trim pot accessible through the bottom of the pedal, which controls the total amount of hi cut. The soundfile is contributed by Nut. 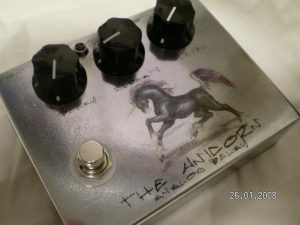 The Unicorn is an analog delay of my own design, three BBD circuits (V3205) gives about 600mS of analog delay. Soundclips are recorded by Björn Greder. 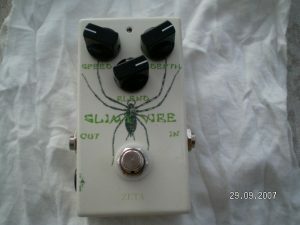 A vibrato effect with knobs for Blend, Speed and Depth. It goes from 1.8-12Hz in speed. This is an ongoing project. A modified version of the original. The mod is a chorus mode and truebypass. Last clip is in chorus mode. A stand alone spring reverb, recorded in the effect loop of a solid state amp. A delaypedal based on the Princeton PT2399 delaychip.